This project was initiated with the intent to provide space for neighbors to grow high quality vegetables, where their own lots might not have the right growing conditions, or would be too big of a job for the occupant. The concept of no-lawn front yards isn’t new at all; early colonists’ homes were planted with flowers, herbs, and vegetables in any part of their yards, where best suited. People shared their excess bounty with others who may have experienced less success, or losses from crop failure and pillaging. The original White House had its own vegetable garden for the stately residents, and the Victory Garden concept established by Eleanor Roosevelt during WWII, provided almost 40% of the nation’s produce. It is in the sub-urban settings and rural housing developments that lawn became increasingly “standard policy” for front yards during the 20th century. 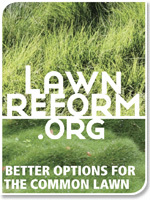 Lawns DO have a place and purpose in the world; the question is how much of it is needed? It is NOT a rant against lawns, but a suggestion of alternative perspective. There are plenty of other people (moderates and extremists) taking on the crusade against “grass lawns”. Very heated arguments and a lot of intolerant remarks abound on the Internet, regarding “energy-usage” of grass lawns versus edible gardens. Or, the economics of gardening versus buying cheaply at a produce store. Those issues do not need to be visited here. It is all about choice. Do you want to have more control over what you eat, when possible? Do you want easy access to more vibrant, nutritious produce? Or, do you want to water, week, feed, and mow a lawn? Maybe you want both and have room and time for both lawn and vegetable garden. Great! Are you poisoning the system with chemicals to maintain the lawn and/or the vegetables? Maybe, maybe not. Here we are focused on the intent of growing vibrant food which can be shared with others when there is excess bounty. Four hundred square feet of space has yielded easily thrice as much produce as its participants can use. We’re donating the rest to help those with less purchasing power. No one has to starve! Where and when do you want to start?